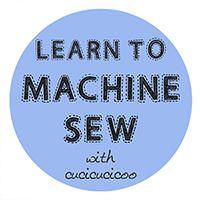 Earlier this week I published a nice, long post for my Learn to Machine Sew series all about PUL fabric: how to prepare it and tips for sewing it without going totally bonkers! So now that you know everything there is to know about PUL (well, more or less…. 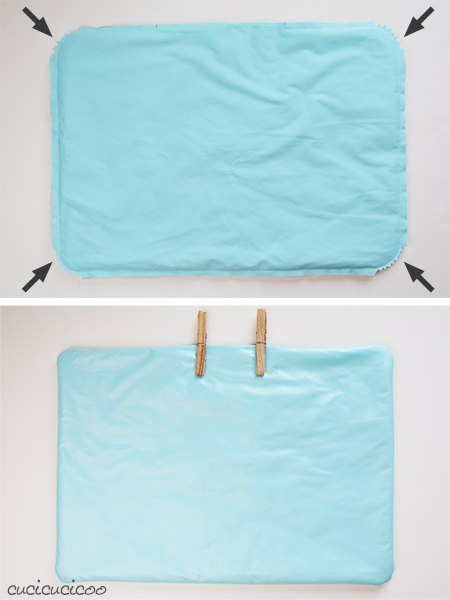 ), let’s sew something useful with it: a travel changing mat for babies! What if you don’t have any diaper-wearing babies? 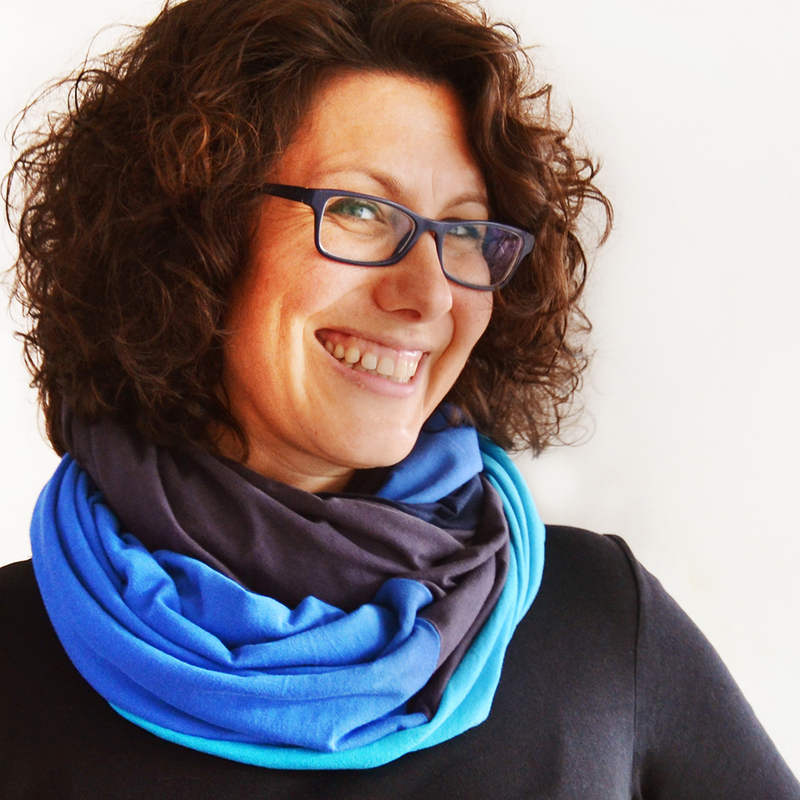 Make one anyway– these are a highly appreciated gift for any new mom! Nobody wants to change their precious baby’s diaper on a scummy changing pad in a public or store bathroom. Or what if you’re in the park when a massive blowout occurs? Just lay out one of these pads on the grass or on a parkbench and get that mess taken care of ASAP! 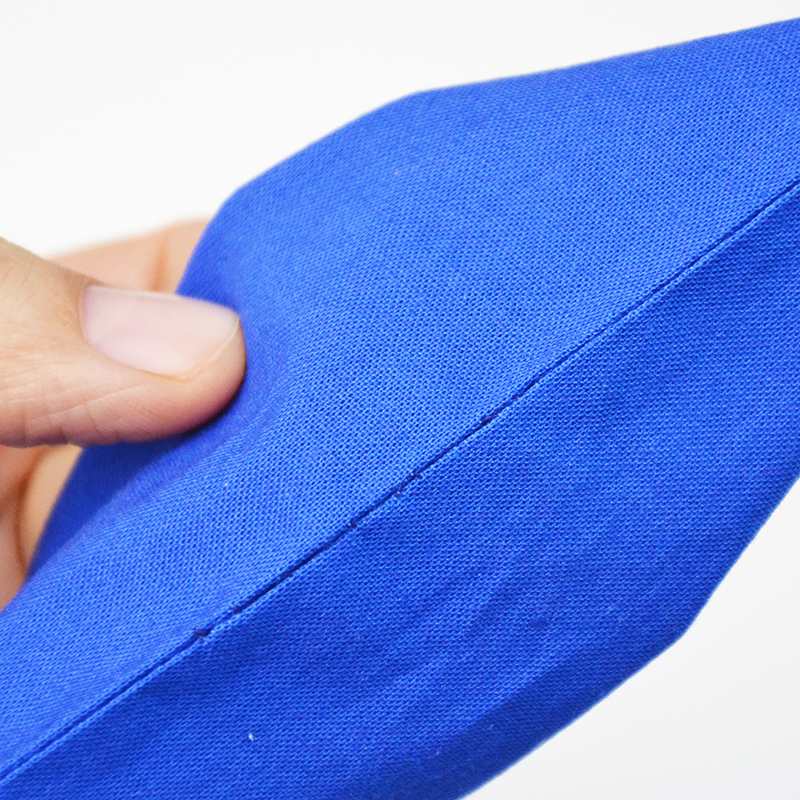 You can fold these mats into fourths along the central sewn lines and just stick them right in your bag! 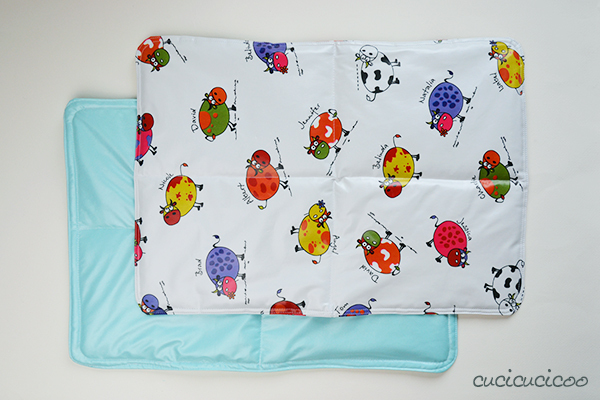 Or, if you have a particularly squirmy baby, making it dangerous to change him on an elevated changing pad, use these changing mats right on the living room floor to avoid any accidental falls or near-falls. And when they get dirty, just wipe them off with a damp cloth! This is a pretty simple design, just a rectangle with rounded corners, but you could always add a little strap with a snap or velcro to keep it closed, or add a little pouch or drawstring bag to hold it in. 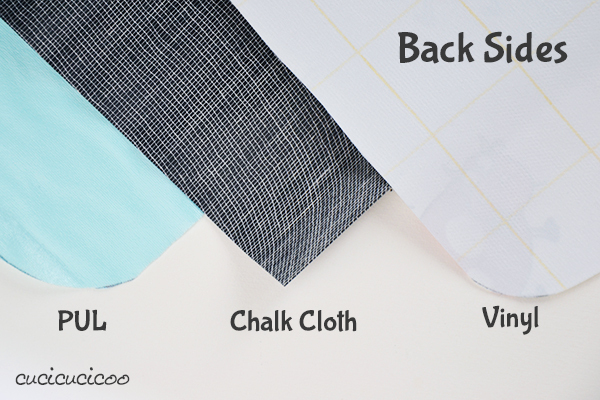 Let’s talk fabric. 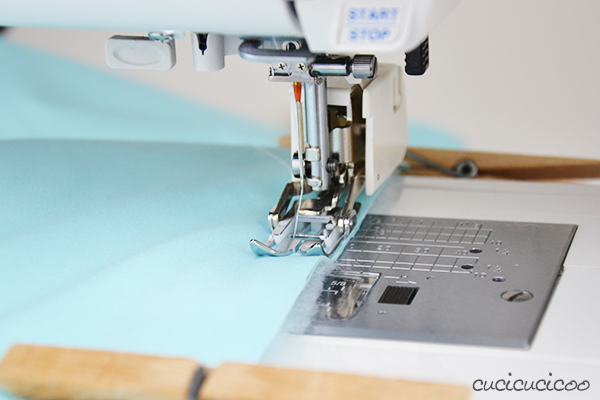 As this tutorial’s purpose is to practice sewing PUL, I will show you the steps with PUL. However you could use other laminated fabric, too, such as oilcloth. I also made these from a vinyl “fabric” which I believe is a lower quality oilcloth (the type used for waterproof tablecloths that is sold in hardware stores. Here in Italy it has the same name as oilcloth, so I’m not totally sure if it would be considered such in English, too. Can you help me out, English speakers?!). So, feel free to do this tutorial with oilcloth, too. I’d just suggest you use a longer stitch length with a vinyl-ly oilcloth because, being stiffer, the perforation made by the sewing needle could lead to the vinyl tearing along the stitching. 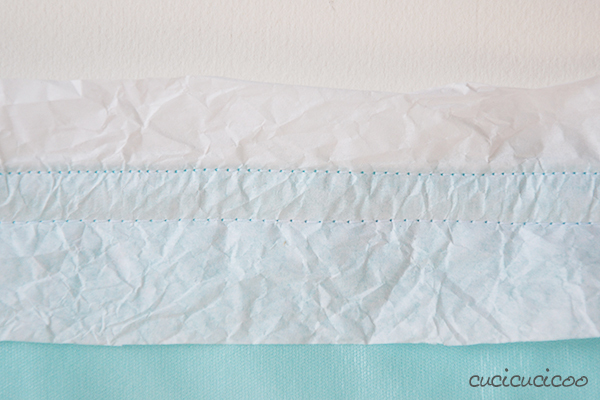 I want to show you the difference between PUL and oilcloth. 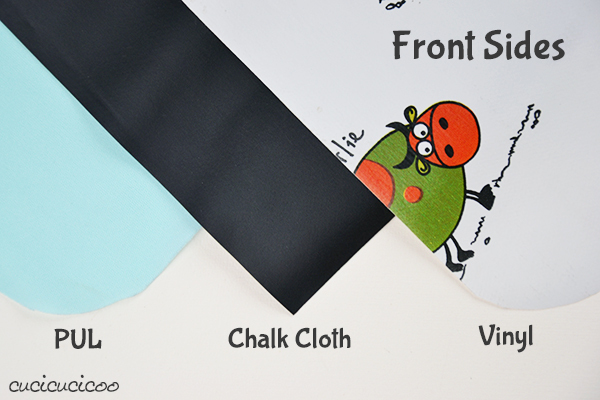 Here you can see the front/top/right sides of PUL, chalk cloth (which is a type of oilcloth) and that vinyl which may or may not be oilcloth. 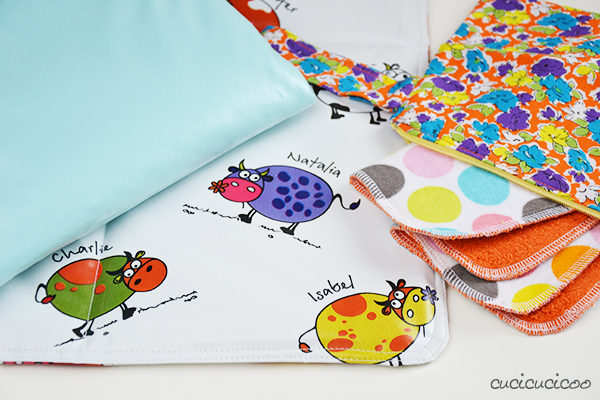 The front of the PUL is just regular fabric, while the front of the chalkcloth/oilcloth/vinyl fabrics is plastified. When you look at the back/wrong sides, you’ll see the PUL’s lamination, while the chalk cloth/oilcloth/vinyl fabrics have a woven backing. 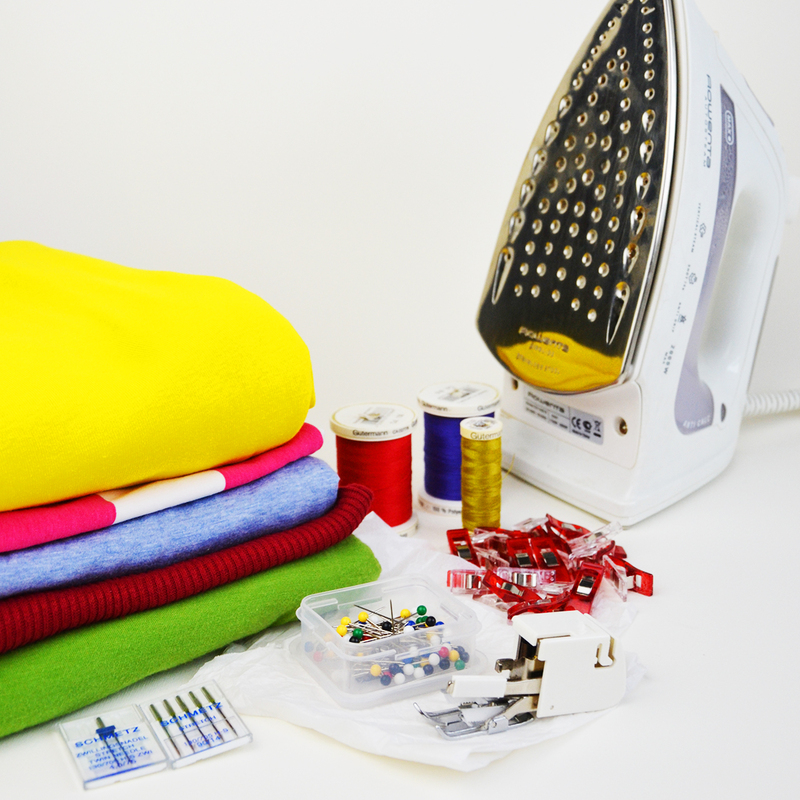 As I mentioned in the last post, laminated fabrics can be very tricky to sew, but luckily there are some tricks to sewing them easily. One of these tricks is to use a walking foot. As I mentioned in last week’s sewing lesson, the walking foot is also very useful when sewing multiple layers of fabric. Therefore I highly suggest you use this foot for this project. Let’s make the pattern. 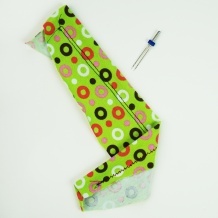 Seeing as we don’t want to pin the pattern to the fabric (remember, we don’t want to ruin the fabric with pin holes! 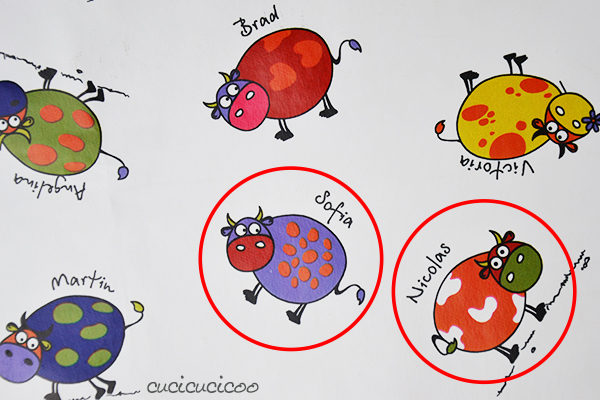 ), use a somewhat sturdy big piece of paper, which will be easier to trace around. I flattened out a paper shopping bag (which a friend gave to me with some hand-me-downs in it. I’m in no way endorsing the store on the bag. I don’t even know what store it is.) and cut a 52 x 37 cm rectangle (20 x 15″) from it. You may need to tape the bottom flaps or other parts down. 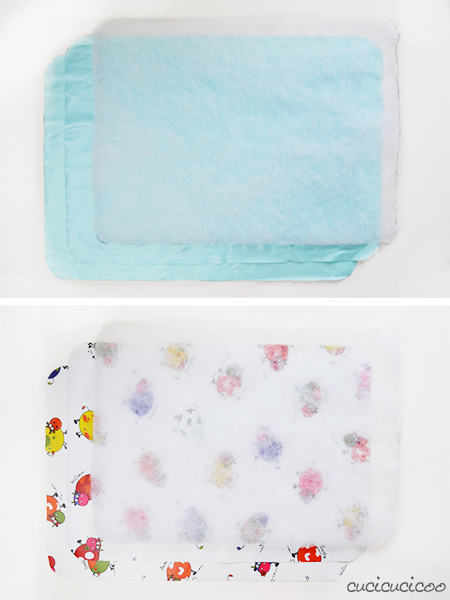 We’ll use a 1 cm seam allowance (3/8″) for this project, so that will make a 50 x 35 cm (19.5 x 14.5 “) changing mat. Obviously feel free to modify the size of the rectangle to whatever size you prefer. Grab a glass, bowl, plate, CD or other round object and trace around it on all four corners of the rectangle, as you can see in the photo above. Then cut along the curves. And there you have your pattern piece. 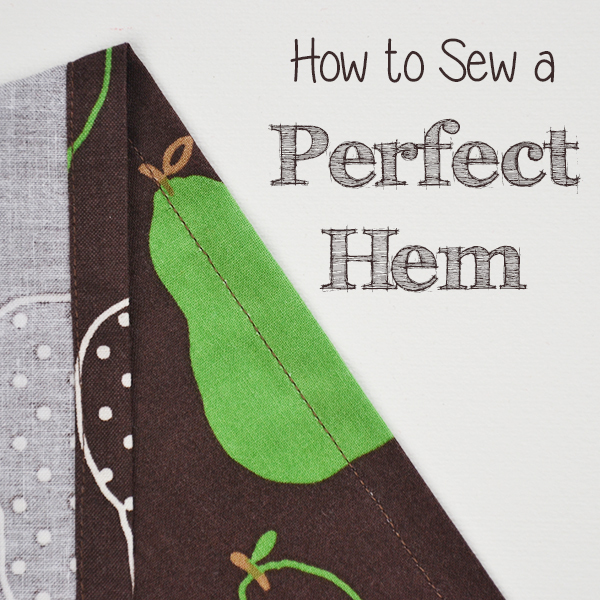 Don’t forget to label it so that it doesn’t get mixed up with your other patterns and so you can remember the size of the finished product and the seam allowance. 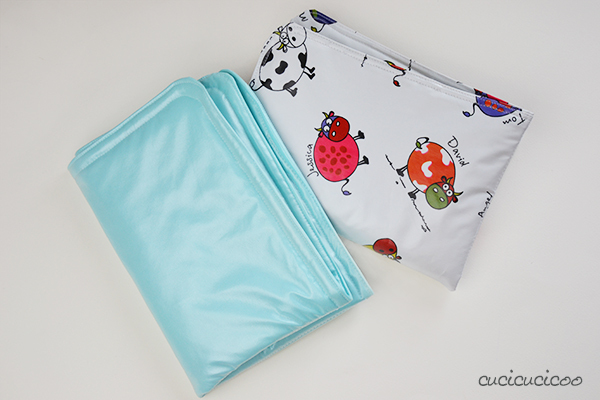 Usually when sewing PUL, you want to hide the lamination, however to make these changing mats wipeable, you need the face the lamination outwards. 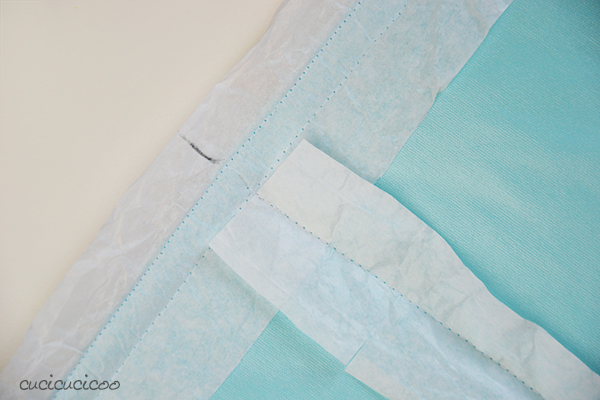 Seeing as the plastified side of PUL is the wrong side and the plastified side of oilcloth is the right side, in this tutorial I’m instead going to refer to “the laminated side” and “the non-laminated side,” just to avoid confusion. 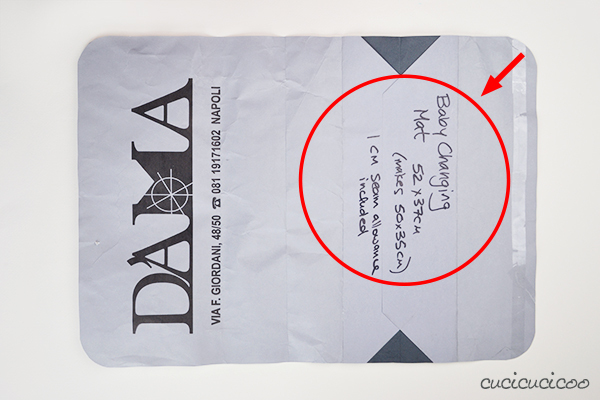 If you don’t want to use a laminated fabric, that’s fine! 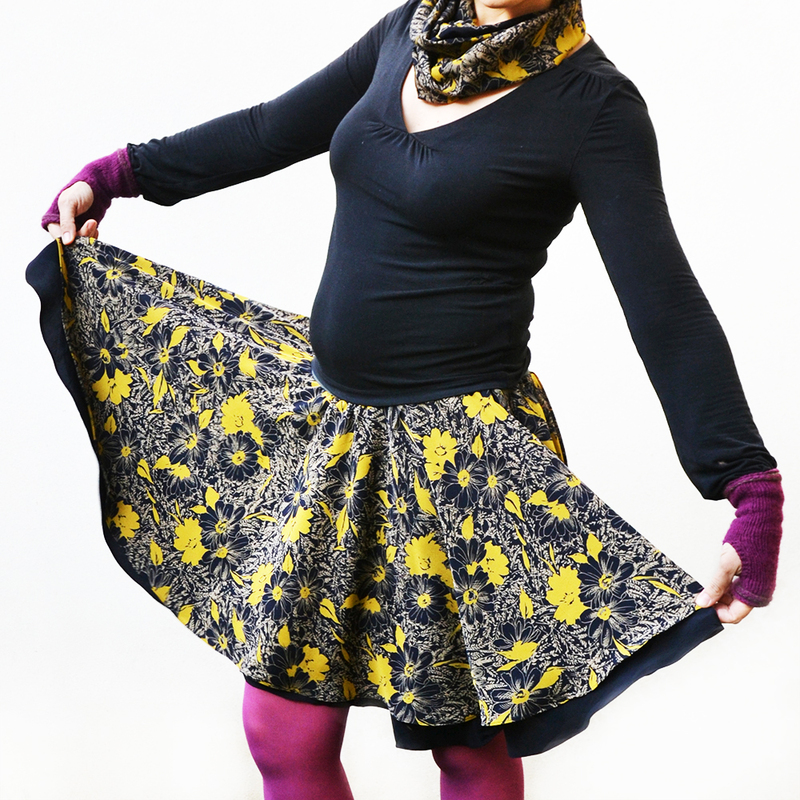 You can use any fabric your heart desires for the outer layers. Just substitute “the laminated side” with “the right side” and “the non-laminated side” with “the wrong side.” Or you could use a soft fabric for the top layer and PUL/oilcloth for the bottom layer. If you want to avoid using batting, you could upcycle an old towel, but just realize that the mat will be a little thicker that way. 3. Position the second mark under the sewing needle and sew all the way around the rectangle up til the first mark with a 1 cm (3/8″) seam allowance. You could maybe get away with a regular presser foot here, but I prefer using a walking foot for all steps of this project because of the three slippery layers. I used a 3 mm stitch length. 6. Topstitch all around the rectangle with at least a 4 mm stitch length. For this project, I like to do one line of topstitching very close to the fabric edge, then a second line of topstitching slightly further away (maximum 1 cm [3/8″] from the edge), but do it however you like. Now that the laminated side is face out, sewing will get stickier… literally. So if you haven’t yet, definitely take out your walking foot now. This was enough for sewing the laminated side of the oilcloth, but not for the laminated side of the PUL, perhaps because of the multiple layers. 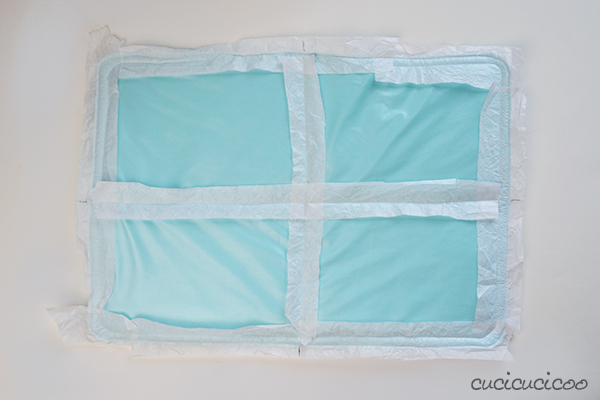 So for the PUL version of this changing mat I actually used BOTH the walking foot and strips of tissue paper (as I described in the lesson about sewing PUL) from this point on. Here’s a close-up of my two lines of topstitching. Look at how long the stitches are in each line. I’d forgotten to switch to a longer stitch lenth for the first line! Oops! 7. 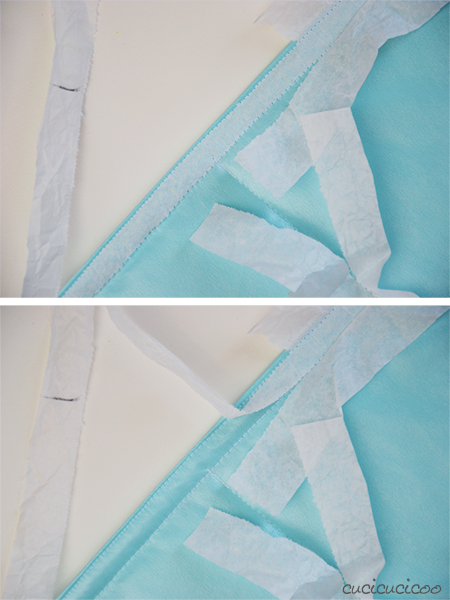 After you’ve finished topstitching (top photo), make a mark halfway along each side with a pen on the tissue paper. 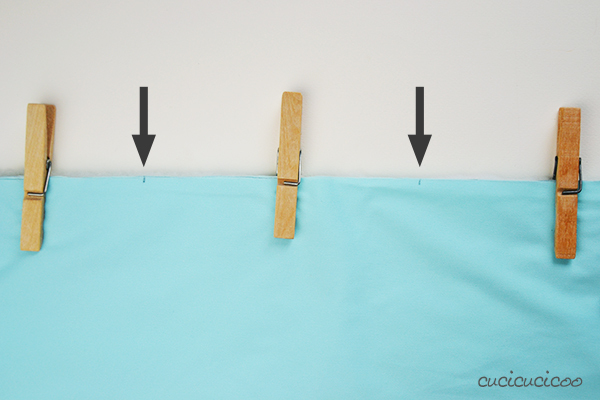 Then fold one side in so that the fabric edge runs slightly to the right of the two corresponding marks (bottom photo). 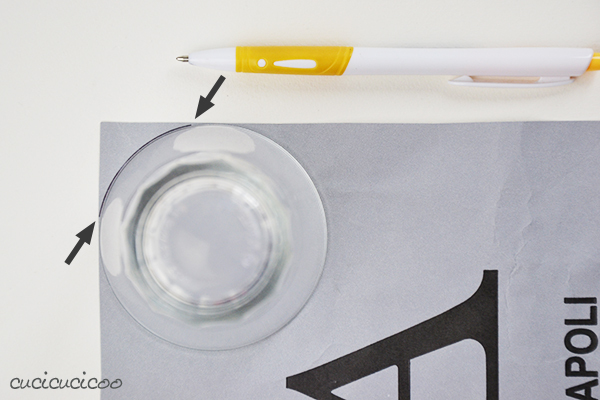 An alternative, which I only thought of after seeing this post on Facebook, could be to stick a long piece of masking tape so that its left edge runs slightly to the right of the two marks. 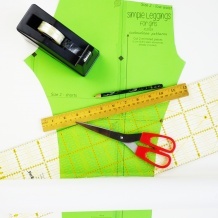 Remove the tape after sewing. 8. Position the needle on the inner line of topstitching in correspondence with one of the pen marks and sew straight to the opposite pen mark, using the folded fabric edge as a guide, as you can see above. 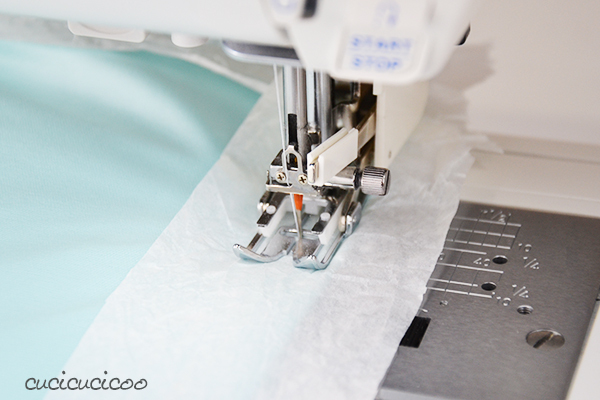 Remember to put strips of tissue paper underneath the presser foot as you sew! 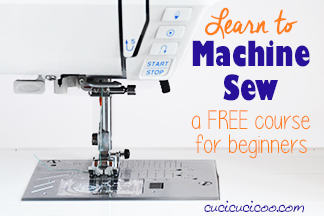 Use the same stitch length you used for topstitching. This is what the stitching should look like. 9. Repeat steps 7 and 8 with the remaining two pen marks made in step 7. The tissue paper cross looks wonky, but the stitching is actually straight. 10. If you used tissue paper, now it’s time to tear it off! As I described in the sewing PUL lesson, pull one long edge of the tissue paper gently away from the stitching, not upwards. Then pull the other edge out from under the stitching. 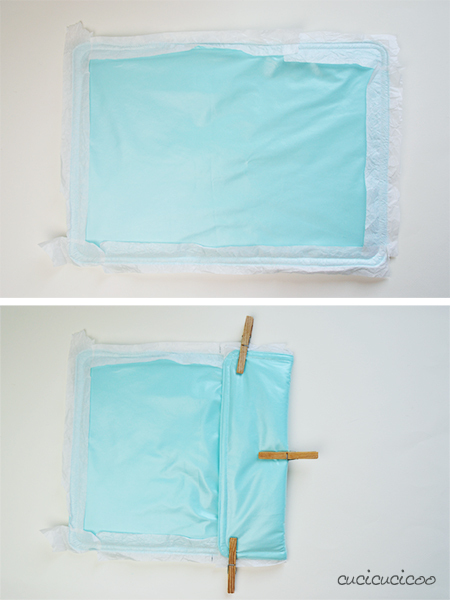 In the case of the double topstitching, pull the two outer sides off first, and then the center will lift right up. 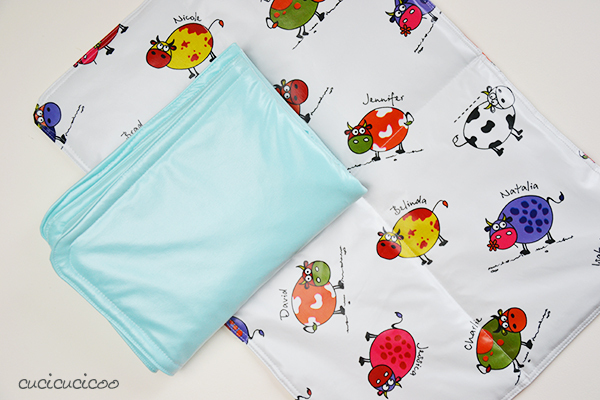 Being a stiffer fabric, the oilcloth version is definitely stiffer than the PUL version, which actually makes it easier to fold up. The PUL one is floppier when folding it. Do note that the oilcloth could split open at the stitched fold lines if it gets folded frequently, which I why I suggested before to use a longer stitch length with that fabric choice. 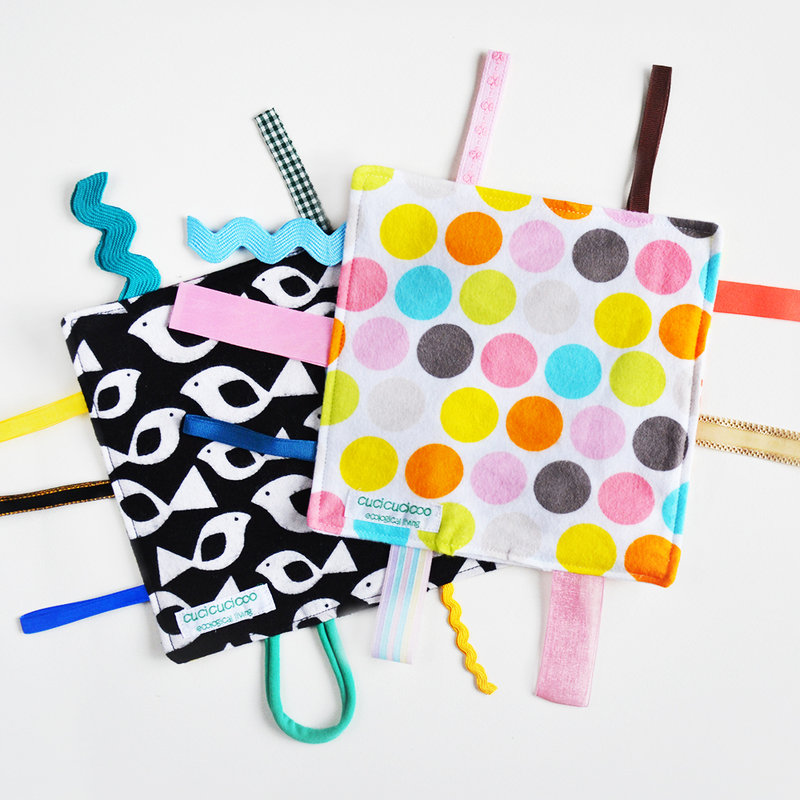 If you’re making a gift for a new mother, why not pair the changing mat up with some cloth wipes and a wet bag for carrying them around? A clean baby = a happy baby. A happy baby = a happy mother! Now for a bit “Yah!” all around! 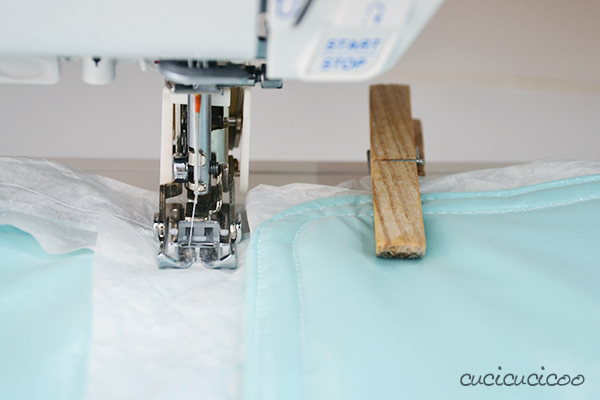 This changing mat tutorial is part of the Cucicucicoo beginner’s sewing course! 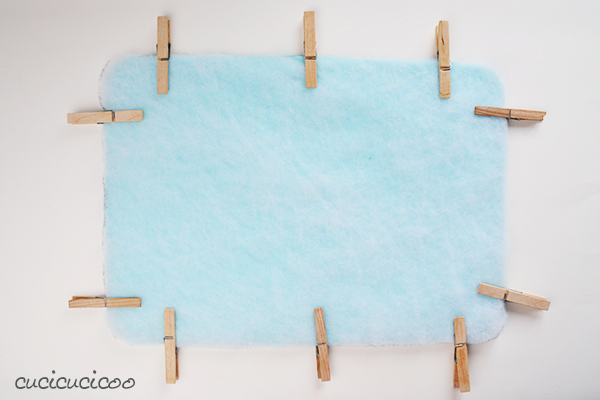 Next articleDIY felt bowtie pasta tutorial…WITH BOX! 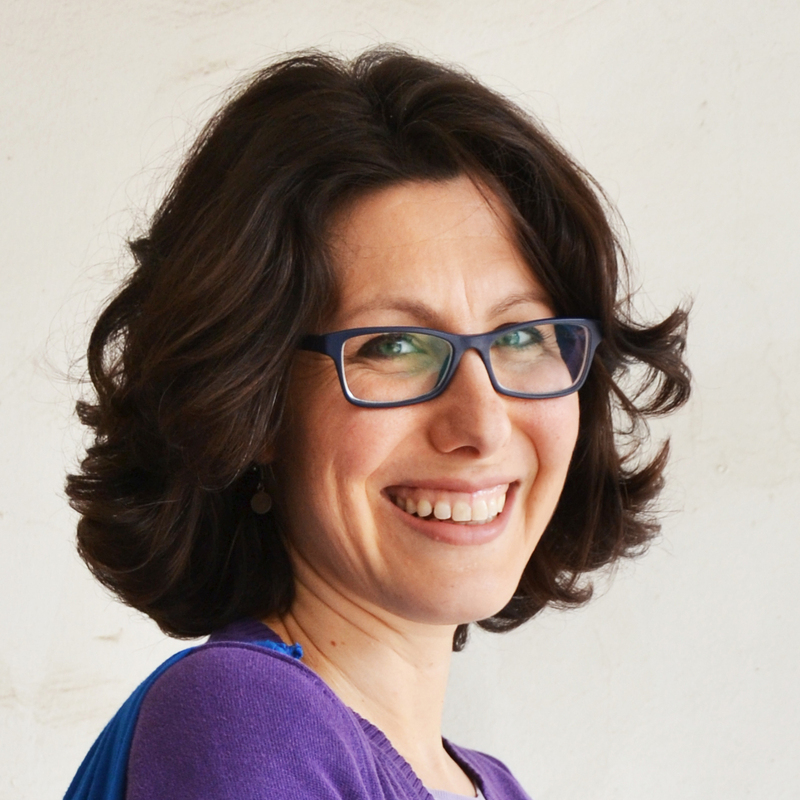 Complimenti Luisa è un fasciatoio da viaggio utilissimo. Ne farò sicuramente uno per quando nascerà il mio nipotino. Grazie di cuore per le tue bellissime idee. Sono contenta che ti sarà utile, Ivana! Hey, Zoe! Thanks! This could of course get jazzed up with bias tape, snaps, and other fun things, but just wanted to keep it nice and simple here! 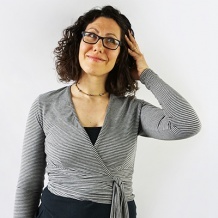 ciao, ho visto su pinterest il link a questo sito di cartamodelli, ttp://www.stylearc.com.au/stylearc/. conosco Style Arc, ma non ho mai comprato un loro cartamodello, quindi non ho idea sui tempi di consegna. Ma sono in Australia, quindi immagino che ci vorranno una paio di settimane. Awesome posts posted! Really cool posts. Good job!